Cultivating plants and vegetables in a greenhouse is a rewarding and worthwhile endeavor. If one decides to build one, best to start out with a clear written plan and a proper foundation. A sound foundation is the basis for any successful greenhouse growing environment. A greenhouse can provide a year round supply of greens without having to be overly concerned about the adverse effects of the outdoor environment. Once, the greenhouse location is selected with abundant sun and shade. As well as proximity to essential services such as water and power. Your greenhouse, whether it is a home attached greenhouse addition or a free standing greenhouse structure, always start by mapping out a layout. Once the area is mapped out with a string line or the ground is outlined with a biodegradable paint marker, there are a few choices to choose from so let’s start with simple alternatives. Depending on the greenhouse chosen and whether it is a seasonal or an all year around growing project. These two factors should be the basis for the type of foundation to build. If it is seasonal, then a topical perimeter base made out of landscape timbers or a 6-8″ wide concrete base wall also called a grade beam is sufficient. Make sure it is properly anchored into the ground. This is assuming that the interior floor of the greenhouse will remain dirt or gravel. can be accomplished by digging concrete corner piers 18″ to 30″ deep – 12″ diameter. Inserting qty 1 – 10″-12″ galvanized anchor bolts embedded into the center of the concrete pier. Secure a six inch wide landscape tie to the concrete pier, making sure to expose the threaded part of the anchor bolt minimum 6″-7″ above the level of the concrete. If using landscape ties the concrete pier should be flush with the dirt. 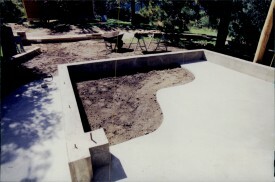 The landscape tie placed on top of the concrete flush with the dirt. Anchoring the landscape tie with properly placed holes drilled in the center of the tie, minimum 6″ from the end corner of the tie. The holes are for the anchor bolts to thread through the landscape tie for anchoring down with galvanized washer and nut. If going with a concrete perimeter grade beam, install anchor bolts 6″ in from one corner and 12″ in from the adjacent corner. Place an anchor bolt every 3-4 feet along the entire perimeter of the concrete grade beam. The cut out area for the doorway, excluded. Place anchor bolts 6″ in on both sides, away from the doorway edge. If going with concrete, another option is to dig out a shallow trench, 8″-10″wide /4-6″ deep and form it with 2×8 or 2×10 timbers to create a level, square base perimeter concrete grade beam. This will allow the concrete grade beam to rise out of the ground minimum 6″ above the grade (dirt) or higher. Preferably 12-18″ is ideal to prevent snow and ice build up during the winter months. A higher grade beam or base wall will also allow for adding new rich top soil on top of the existing greenhouse interior ground. Regardless of the foundation chosen these three building rules must always be true …square – level – and plum! Top plates for greenhouse frames should be standard Douglas fir. Always install and secure a 2×6 or wider, green top plate on top of the concrete grade beam. Although it is perfectly OK to anchor the greenhouse frame on top of the wood sill plate, as a rule its best to install sill plate flashing. Covering the entire width of the sill plate and bent over the outermost edge 2″ down with an outer drip edge. This creates a smooth even surface for sealing the gaps with quality silicone caulk between the greenhouse base frame and the sill plate. This also prevents moisture from leaking and soaking onto the wood sill plate. This flashing feature provides a clean looking greenhouse base appearance protecting the wood sill plate and provides a much longer life span. The best alternative when building a greenhouse is to have a stem wall foundation. A concrete slab requires drains and not considered to be the best alternative. Greenhouses built on concrete slabs should have a centrally located water drain. They must also use plant benches with planting beds filled with soil to grow in. Changing the potting soil is highly labor intensive and preserving the quality of the soil can be majorly exasperating. You’ll find yourself removing the majority of last season’s dirt and replacing it with new dirt every year. Yikes! are u ready for that…? Plants love the earth. Which is why, utilizing the ground inside a greenhouse will always provide a more prosperous and bountiful harvest. Building planter boxes on top of the soil makes for easy watering and maintaining soil nutrients. Raised plant boxes on top of plant benches, will dry and deplete the soil from its nutrients very quickly. Especially inside of a greenhouse with a concrete slab. Ever notice!.. the dirt from a dried out flower pot. Although this alternative is a doable choice, maintaining robust growth inside a greenhouse is always the gardener’s choice.